Brock, Sophie and Huck are living with the Havasupai at the bottom of the Grand Canyon. But their lives are threatened by the murderous and vengeful Paiute, and Brock and Huck, seeing no alternative, race one hundred miles to a small trading outpost, hoping to buy the rifles that will give them a chance against the much larger Paiute forces. Stumbling across four slaughtered Hopi Indians, Brock and Huck track down the murderers, and find help in very unexpected places from friends – new and old. 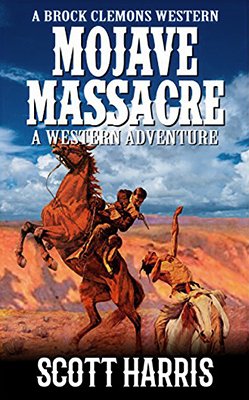 This is the second book in the Grand Canyon trilogy and the fifth Brock Clemons western. Continuing a number of storylines from the previous book, Battle on the Plateau, makes this a must read for those who read that earlier entry into the Brock Clemons series. If you haven’t read the other book then you might prefer to start there but it isn’t essential as Scott Harris includes enough information in this one to explain what happened before. As with his other books Scott Harris often switches from character to character with each new chapter, telling his story from many different viewpoints, and not all of them are human either. This tale mainly features Brock, Huck and Huck’s Havasupai friend, Kentaki, but Harris does include chapters or passages that keep the reader up to date with what the other main characters in the series are doing. Scott Harris writes in an easy to read style that sweeps you up into the storyline effortlessly. Characterization is one of his strong points and his battle scenes are vivid, engrossing and at times brutally violent. This tale is very well paced and builds to its exciting conclusion that delivers everything you’ve been hoping for. Like in his previous books though, Harris has introduced new characters and hints of possible new plotlines that will ensure you’ll want to read the next book in the series, all we can hope is that he doesn’t keep us waiting too long before it appears.